This gluten-free & autoimmune paleo blueberry tart is the perfect healthy treat! 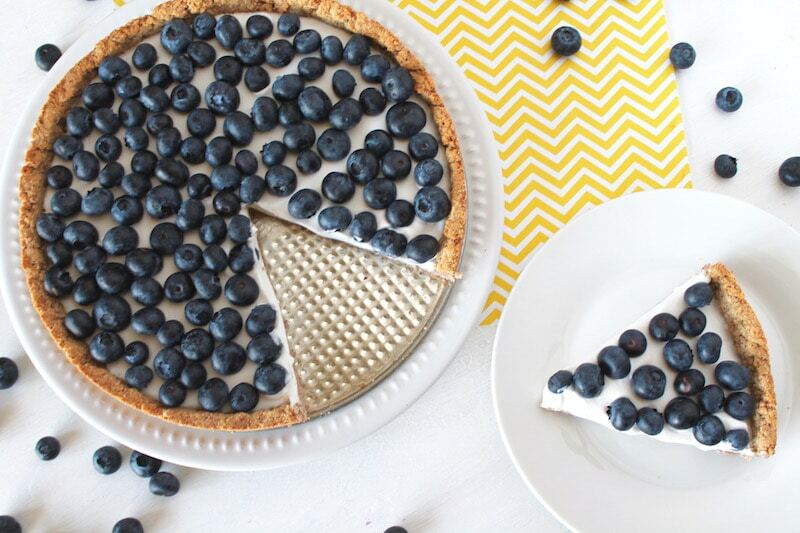 Even if you're not on AIP or the Paleo diet, you'll still enjoy this fresh and tasty tart! 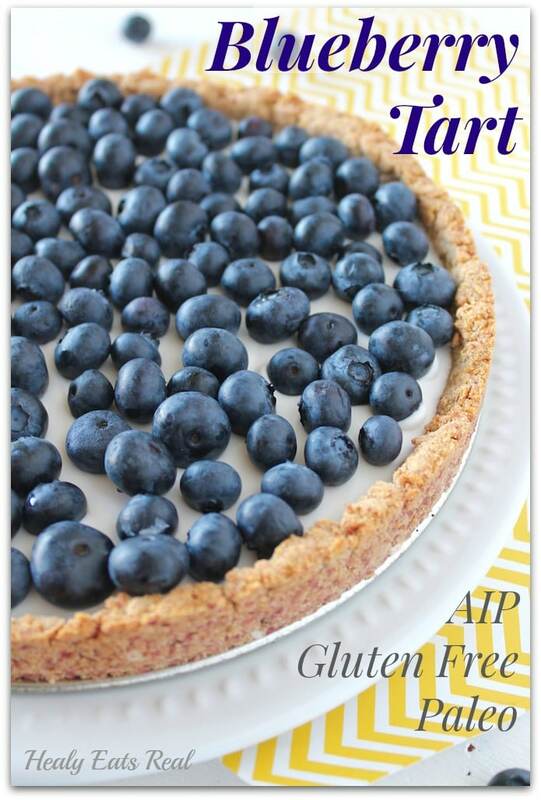 This gluten-free & autoimmune paleo blueberry tart is the perfect healthy treat! Even if you’re not on AIP or the Paleo diet, you’ll still enjoy this fresh and tasty tart! If you are doing the autoimmune paleo diet or have done it before, you’ll love this recipe because you know that desserts are hard to come by on the diet. For those who don’t know what the autoimmune paleo diet is, to put it simply, it is a diet that removes most inflammatory foods to help those with autoimmune diseases heal. It is similar to the paleo diet in that it focuses mostly on whole foods like organic vegetables, pasture raised meats, wild fish, healthy fats and fruit. To learn more about AIP and if it can help you, check out my article here. I was on the autoimmune paleo diet for quite a while last year (I’ve since done reintroductions and have added many foods not allowed in the elimination phase of AIP back into my diet). I have to say that the changes that I experienced from doing AIP were phenomenal. Although I don’t have an autoimmune disease, I do have many issues due to hormonal imbalances and adrenal problems. According to Sarah Ballantyne’s research, AIP not only helps autoimmune diseases, but it also helps bring hormones back into balance. Doing AIP really helped get my body back into balance. While on it, I noticed that my waning energy levels bumped up back to regular levels (my adrenal issues had made me tired all the time), my blood sugar issues balanced out and I generally had a more positive outlook! I’ve heard from many friends and colleagues that AIP has changed their lives, so if you are suffering with an autoimmune disease, I would definitely recommend giving AIP it a try! Want Even More Delicious Paleo Recipes?? Treat Yo’ Self! Imagine this… By staying on track with a clean-eating lifestyle, you can count on better energy, clearer skin, a healthier body AND peace of mind. My name is Hannah Healy and I’m the creator of the Healy Eats Real blog and the author of Paleo Vegan Sweets & Treats. I’ve noticed a huge change in my health, skin, energy and body since I’ve adopted a clean-eating diet. I’ve been developing tasty healthy desserts to rave reviews for years! Now you can satisfy your sweet tooth and your family with indulgent delectable paleo sweets and treats that won’t mess up your clean eating lifestyle…..without falling back on eating the same boring food over and over. My Paleo Vegan Sweets & Treats cookbook provides the flavorful nutritious recipes that hits the sweet spot every single time. 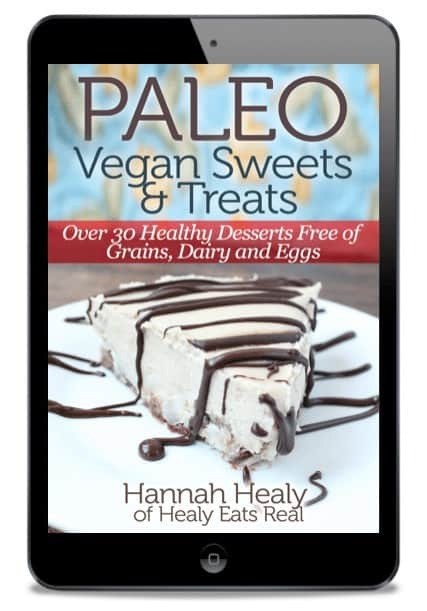 Click here to get your copy of Paleo Vegan Sweets & Treats! In a food processor or high powered blender (like a vitamix) add the dates and blend until they are finely chopped almost into a paste (about 1-2 minutes). The pureed dates may stick into a ball--this is where you want to stop. Add the coconut oil to the food processor and blend for about 30 seconds, this will break up the dates. Then add the remaining crust ingredients (arrowroot, coconut flour, baking soda, salt, vanilla extract and apple sauce) to the food processor and blend until all the ingredients are fully mixed (about 1-2 minutes). Stop and scrape down the sides of the food processor to get any stuck ingredients and pulse for a few seconds more. Spread 1 tbsp of coconut oil to grease the 8 or 9 Inch Tart pan. Then sprinkle the crust ingredients evenly in the pan. Use your hands to press the crust dough evenly into the pan mold, taking care to press the dough all the way to the tops of the sides. Once the dough is firmly and evenly pressed into the tart pan, place it into the oven for 15-20 minutes or until the sides have started to get golden brown. Then remove the crust from the oven and allow to cool for about 30 minutes or until it is cool to the touch. To make the filling you'll need either 1 14 oz. can of unsweetened coconut cream or 1 13.5 oz. can full-fat coconut milk refrigerated overnight. You'll need to use a can of full-fat coconut milk--light coconut milk or boxed coconut milk will not work. If you're using the coconut cream, you can scoop the whole thing out of the can into a bowl. For refrigerated coconut milk, you can scoop the coconut cream out of the top into a bowl and leave the clear liquid at the bottom (you can discard the liquid or use it in smoothies). The coconut cream will be hard. Use a whisk to break it up and gently whip it until it becomes the consistency of whipped cream. Add the vanilla and a dash of salt to the coconut cream and mix it. 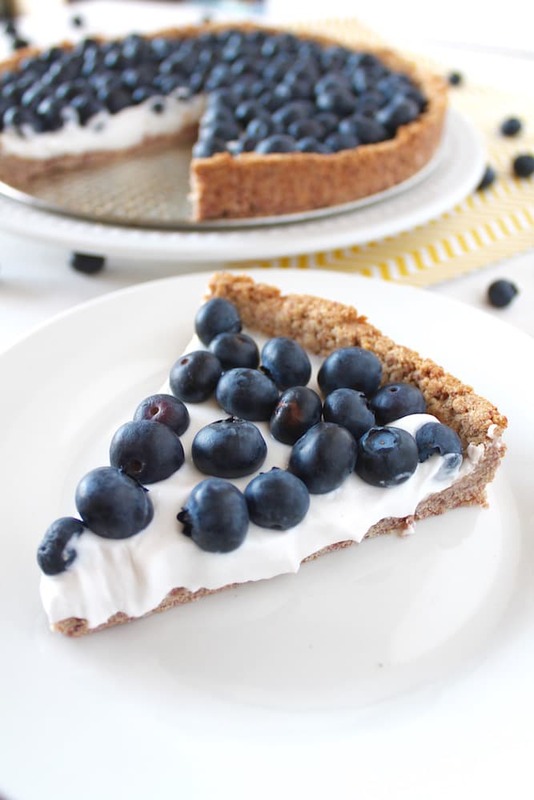 You can also add maple syrup to the coconut cream to make it sweeter if you prefer--I didn't add any sweetener to the coconut cream and for me the crust and blueberries were sweet enough. Once the crust has cooled, scoop the coconut cream into the crust. Then put the crust and coconut cream in the refrigerator to let the coconut cream set (about 10-20 minutes). If you touch the coconut cream with your finger and it makes a small dent that stays in place, then it is set. Remove the crust from the refrigerator. 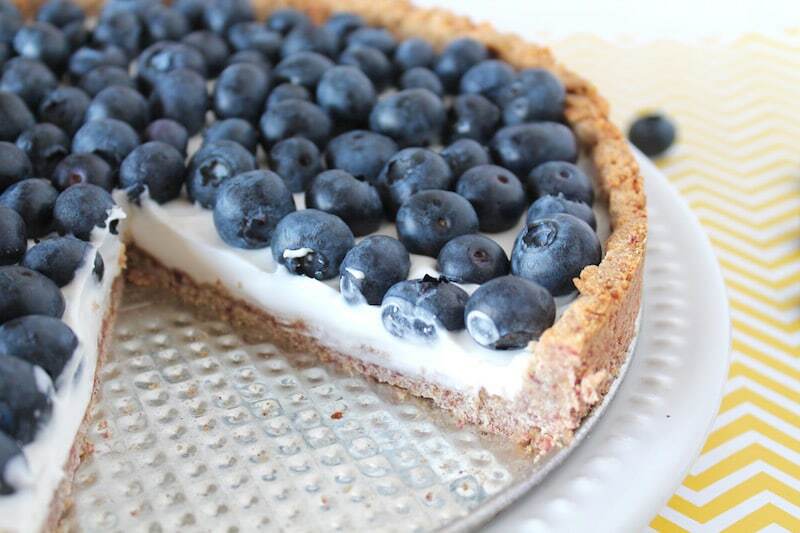 Add the blueberries evenly over the coconut cream and you're all set! The tart is ready to be eaten. Keep any leftovers in the refrigerator since the coconut cream can soften. What kind of dates did you use? medjool or deglet noor? I used medjool, but I think deglet would work too! This didn’t come out good like yours looks. My coconut cream concentrate ended up like a paste. Did I beat it too long? I just spread it out on the crust and is in the fridge now. I hope it is not too thick to enjoy it. You may have used the wrong type of ingredient. I used coconut cream, not coconut cream concentrate…I’ve never heard of the concentrate, so that may be why it doesn’t look the same. I get cans of coconut cream from trader joe’s or you can use a can of full fat coconut milk refrigerated overnight. Is raw coconut butter the same as coconut cream? Hi Orlee, No, they are very different. If you substitute them it wont turn out right. If you read through the recipe you’ll see how you can make coconut cream with a can of full fat coconut milk. Enjoy! Beautiful! And I bet it is yummy. I made this for the first time for company (always a scary thing to do!) and it turned out FANTASTIC! It made a lovely presentation and was a wonderful light dessert on a summer day. 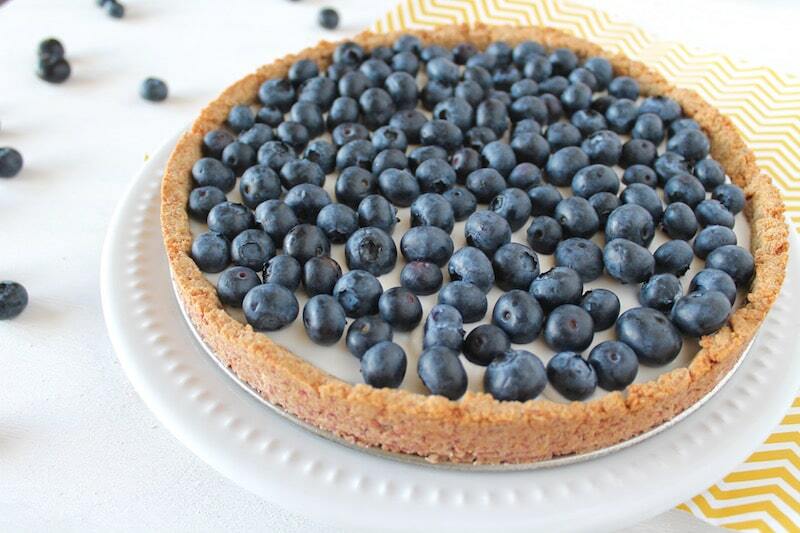 I blended a bunch of blueberries and drizzled it over the tart and plate before sprinkling with the berries. As I was eating it, I had the thought that the crust would make a great snack bar by itself since I am always looking for something easy to throw in my purse for times out and about. 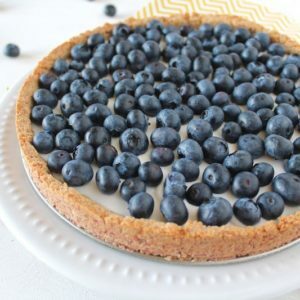 Has anyone tried other desserts made with this crust? It reminded me of a fig newton! THANKS for the great addition to a small list of treats we AIP folks can enjoy! I’m so frustrated! I’ve made this delicious recipe so many times. The last time I was at Trader Joe’s they did not have the same coconut cream in the brown can. They had an organic one that I purchased. I’m trying to make it today and it is not working! Plus, the coconut cream splattered all over my kitchen. Have any suggestions? Thanks in Advance. I noticed that Trader Joe’s changed their formula for coconut cream and it’s not a good consistency anymore. It’s a shame! I’m testing new brands to try to find one that works. Stay tuned! Yes! I’m dealing with the same issue ina a variety of different recipes! Any help you can give would be great!